Laurel Volunteer Fire Department donates used ambulance to Texas first-responders. 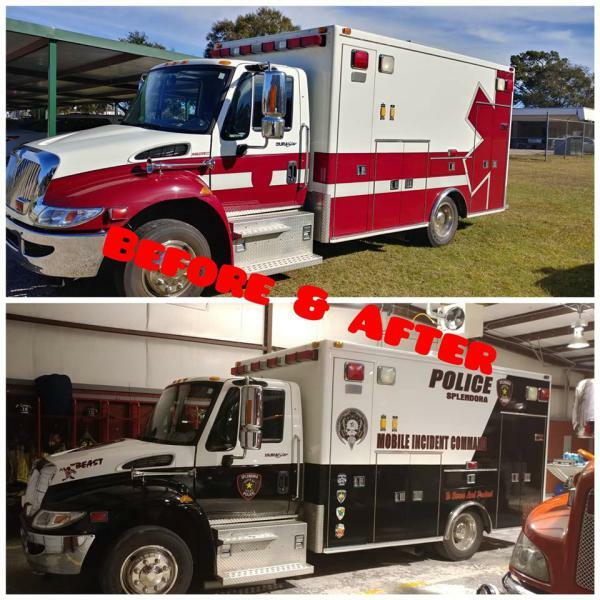 Recall back in November 2017, the Laurel Volunteer Fire Department donated our used ambulance (A108) to fellow first-responders from the East Montgomery County Fire Department and City of Splendora Police Department just outside of Houston, Texas. They were hit hard by Hurricane Harvey and in need of equipment to help them carry on with providing emergency services to the surrounding area. They have reconfigured the unit to fit the needs of their departments (Fire and PD)...it is now a Mobile Incident Command Unit. The LVFD is happy that we could help our fellow first-responders and that the City of Splendora residents are now benefiting from our refurbished A108! It looks good and they call her "The Beast".